At least 25 non-native species of fish have entered the Great Lakes since the 1800s. Because of the Elk Rapids dam, these invasive fish species, particularly the most harmful such as the round goby, sea lamprey, Eurasian ruffe, White perch and alewife have never entered the Elk River Chain Of Lakes (ERCOL). As ESLA participates in the relicensing of the ER dam, we will strongly oppose the inclusion of a fish ladder at the dam that has the potential of allowing any of these invasive fish species into ERCOL. Warning: Juvenile Asian Carp may be easily confused with common minnows. Purchase your bait only from reputable sources that are routinely inspected by the Michigan DNR – question the seller! Zebra Mussels (Dreissena polymorpha) are an invasive species that were introduced into the Great Lakes in the late 1980s and have found their way to our ERCOL. these freshwater bivalves colonize anywhere they can attach their tiny byssal threads. Many lake residents have indicated that thick colonies have attached to their docks, boat hulls, and water intake pipes. They are highly prolific reproducers; female zebra mussels can produce 1 million eggs per year! And, we believe that they are negatvely affecting our lakes and rivers. The sheer number of zebra mussels in combination with their feeding habits has caused severe disruptions in aquatic ecosystems. Each zebra mussel is capable of filtering a liter of water per day; thus, removing almost every microscopic aquatic plant and animal (phytoplankton and zooplankton). This ecosystem disruption impacts aquatic organisms throughout the food chain, from tiny crustaceans to large trout. The effect of their feeding habits is easily discernable in water transparency data collected by volunteers, which shows that water has become clearer in lakes infested with the mussels. Increased water clarity has lead to yet another impact from zebra mussels; sunlight penetrates to greater depths and results in increased growth of rooted aquatic vegetation and bottom-dwelling algae, such as the increasing brown mat in Elk Lake. Inspect and remove aquatic plants and animals from boat, motor and trailer. Drain your live bait wells, bilge water, and transom wells before leaving the water access area. Phragmites (Phragmites australis), also known as the common reed, is an aggressive wetland invader that grows along the shorelines of water bodies or in water several feet deep. It is characterized by its towering height of up to 14 feet and its stiff wide leaves and hollow stem. Its feathery and drooping inflorescences (clusters of tiny flowers) are purplish when flowering and turn whitish, grayish, or brownish in fruit. 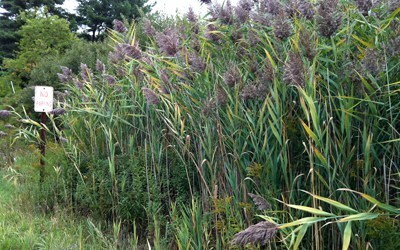 Eventually, Phragmites become the sole dominant plant in many of these wetlands at the expense of native flora and animals dependent on these native habitats. Invasive Phragmites are negatively affecting the shoreline of our neighbors living on the East Bay of Grand Traverse Bay. They are being effectively addressed by concerted efforts by the Antrim Soil Conservation District in partnership with townships and property owners and associations. In 2009, ESLA performed a thorough survey of the shores of Elk and Skegemog lakes and identified only naturally occurring Phragmities and no invasive species. We will repeat this survey during 2011. For assistance in discerning the difference between the naturally occurring species and the invasive species, visit the TOM website provided above. Eurasian watermilfoil (Myriophyllum Spicatum) is a native to Europe and Asia that was first documented in North America in the mid-1940s. Since its introduction, it has spread to more than 40 states in the US and to three Canadian provinces. Unfortunately, Eurasian watermilfoil has invaded many Northern Michigan lakes including Burt, Long, Paradise, and Walloon Lakes. We have not had any infestations in Elk or Skegemog Lakes, but there were recent beds discovered in Clam River/Lake and in the northernmost lakes of ERCOL. As Eurasian watermilfoil takes hold in a lake, it causes problems for the ecosystem and for recreation. It tolerates lower temperatures and starts earlier than other aquatic plants, quickly forming thick underwater stands of tangled stems and vast mats of vegetation at water’s surface. These dense weed beds at the surface can impede navigation – and no one likes to swim in areas thick with aquatic plants. 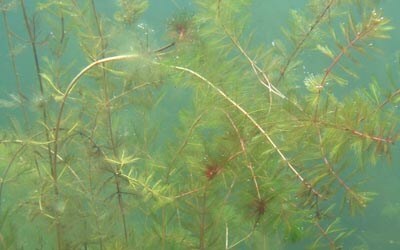 The lake ecosystem suffers because Eurasian watermilfoil displaces and reduces native aquatic plant diversity, which is needed for a healthy fishery. Infestations can also impair water quality due to dissolved oxygen depletion as thick stands die and decay. Please report any suspicions of Eurasian watermilfoil to your ESLA zone captain.